While coming back from Varanasi to Bengaluru, we flew to Delhi and covered prominent landmarks of the national capital. The trip was jam packed as we had a day's time before we our departure to Bengaluru the next day. Qutub Minar : Our first stop was at Qutub Minar. 75.1 meter high monument was visible from a great distance. Even before we entered the Qutub complex, we had a glimpse of it from the bus we were travelling. It was dusk when we reached the place. Nicely paved path amidst green lawns, lead us to the UNESCO world heritage site. Next day morning, we made a plan to visit Banaras Hindu University(BHU). It was exciting to visit BHU as we had read about it in history textbooks. Pandit Madan Mohan Malaviya and Dr. Annie Besant were behind the establishment of one of the top residential universities in India. The Worship of Rivers : In Temples in India, Aarti is offered to the presiding deity. Aarti, a ritual rooted in Vedic culture is a pooja(worship) to the image/statue of the deities. But have you ever observed the worshiping of a river? In Karnataka, I have seen the river Kaveri being worshiped in Talakaveri. It is worshiped there in a small shrine. 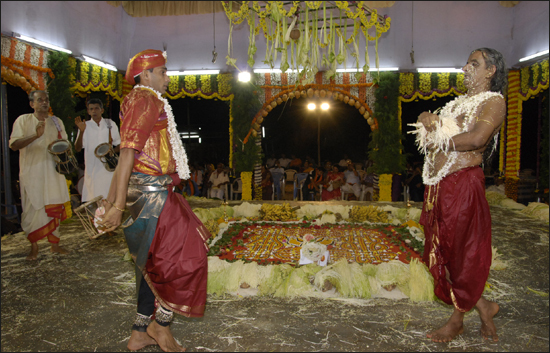 Thus, worshiping of natural forces is one of the central aspects of Sanatana Dharma. Ganga, The Eternal River : Ganga, the 2,525 km long river is worshiped throughout its course, especially at important pilgrimage centers in northern part of India. I had witnessed Ganga Aarti for the first time couple of days ago in Prayag. Ganga Aarti, a visual spectacle, is not to be missed if you are travelling along the course of river Ganga. Waving of light emanating from the multi wick brass lamps with rhythmic ringing of bells and chants forms one of the spectacular shows on earth! Aarti at Dashashwamedh Ghat : Ganga Aarti is performed at two sites in Dashshwamedh Ghat simultaneously. Soon after Ganga Snan, we were near one of the sites of performance. Usually Aarti is performed at the ghat near the steps leading to the river Ganga. As the river had flooded the shores, alternate arrangements were made. Back in Varanasi : We came back to Varanasi after visiting Sarnath on that day. River Ganga (or Ganges) had flooded the ghats(shores), with some temples submerged in Dashashwamedh Ghat. Locals told us that no one would be allowed to take a dip in the holy river. We came to know the seriousness of what they said only when we arrived at the shore near the Dashashwamedh Ghat. Boats made the barricade for anyone venturing the act and there was more to it – the Jal Police! Jal Police or water police – I was hearing it for the first time in my life. Jal police from UP Government was keeping an eye on the adventurers. On the other hand, three among us were keen to take a dip. I was hesitant after reading about the polluted water in the river. You can also see the Clean Ganga posters all over Varanasi! Sri Digambar Jain Temple at Sarnath is of historical significance. It is at this place, which is also called Simhapuri, 11th Tirthankara of Jainism, Shreyansnath was born in the Ikshvaku dynasty. Yes, Lord Ram of Ramayana was also born in Ikshvaku dynasty. Till we reached Saranth, I was assuming it to be a Buddhist site. But after seeing the Jain Temple, I thought it must be a Jain pilgrimage center too. But the temple was constructed in the 19th century in 1824. Jain Temples are always abode of peace, symbolic of the non-violent religion. In fact, Thousand Pillar Jain temple in Moodabidri near Mangalore is one of my favorite places to unwind. Just sitting in the temple corridor relaxes the mind!